when it comes to vibration technology and vibration insulation . Here you can learn what vibration technology is and what it is needed for. By the way: we have explained many of the terms used here in our glossary in an easy and understandable way. What is vibration technology and how does vibration insulation work? The objective in installing a machine on vibration-isolating mounts is to reduce its impulse and sinusoidal vibration. 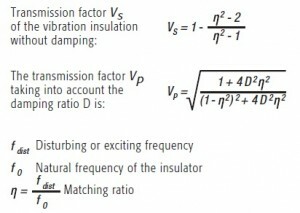 The effectiveness of vibration isolation depends to a great extent on the relationship between the disturbance frequency and the natural frequency of the insulator (matching ratio) and its damping properties. With source insulation the excitation frequency is the machine speed or stroke rates, with receiver insulation disturbing ground vibrations. Generally it can be said that the lower the natural frequency of the insulator the better the efficiency of the insulator, i.e., the larger the ratio of disturbing frequency is compared to the natural frequency. 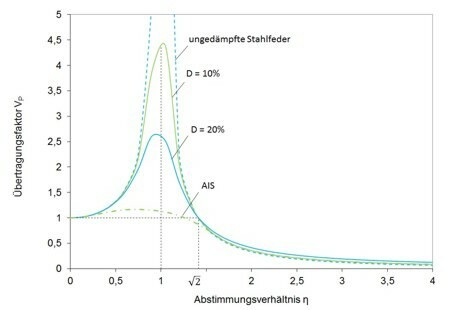 The resulting graph shows that an isolating effect only occurs when the value of the harmonizing ratio is greater than √¬2. At smaller values an amplification (resonance magnification) of the disturbing force may also occur. Typically, the objective is to achieve a ratio of between 3 and 4. Essential characteristics of shock are its duration, its distribution and its intensity. With shock insulation, the dynamic disturbing pulse, consisting of a high power peak over a short period of time, generated e.g. by presses, stamps or hammers, is changed to a longer lasting pulse with smaller forces. Unlike periodically excited vibrations the isolated system oscillates at the excited natural frequency of the isolated system and not in accordance with the excitation, for example, the number of strokes. This can be compared with a tuning fork, which always produces a sound of a constant pitch. Vibrations are everywhere, but they are not always disturbing. A simple example that everyone knows is the washing machine doing the spin cycle. That is acceptable. However, a big press or punching machine in motion can have a huge negative impact on surrounding machines or people. The other way round, a sensitive measuring instrument has to be protected from even minor vibrations to be able to work precisely. Vibration and structure borne noise insulation on a larger scale can also be necessary in buildings. In case a direct insulation is not possible and the intrinsic rigidity of a machine is not sufficient, a rigidly designed platform or concrete foundation will be used (foundation isolation). In other cases, whole rooms were isolated from vibrations and structure borne noise, e.g. in laboratories and test cells (room acoustics). Why do you need vibration technology? Demands on the design and operation of modern machinery and equipment continue to escalate. The technical capabilities of today’s machines in terms of machining speed, dynamic load changes and achievable precision, as well as the key features of the geometry and the properties of the materials used have grown steadily over recent years. However, this also increases the need to reduce the transmitted vibrations and structure-borne noise. This concerns both the emission of vibrations (source insulation), for example in metal-working machines, as well as machines being subject to vibrations (receiver insulation), e.g. in measuring machines. The importance of measures to protect people, buildings and the environment also continues to grow. Here you can find examples for applications of Bilz products. 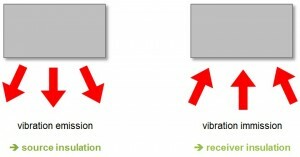 Which solutions are there for problems with vibrations? Here you can find an overview of all products. Apart from that, we also provide our services in vibration analysis and measurement and consultation with the help of our experienced sales force. 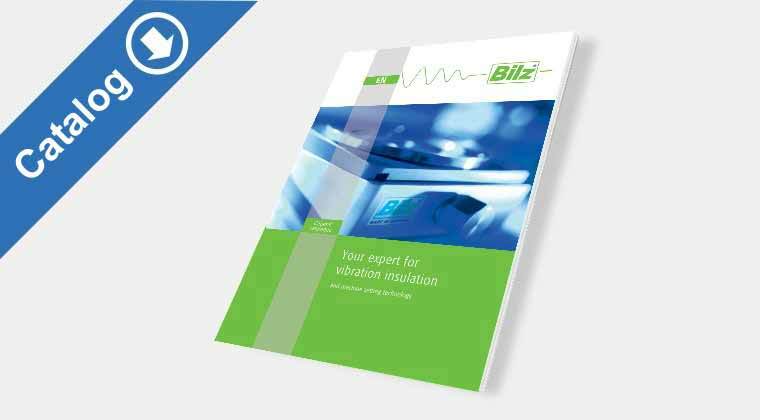 Development, production, assembly and distribution of Bilz Vibration Technology AG have been ISO certified.